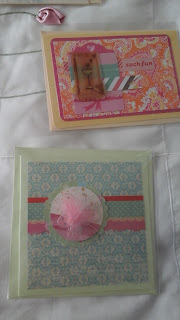 Hi - now that all the gifts have gone, I can post about them. 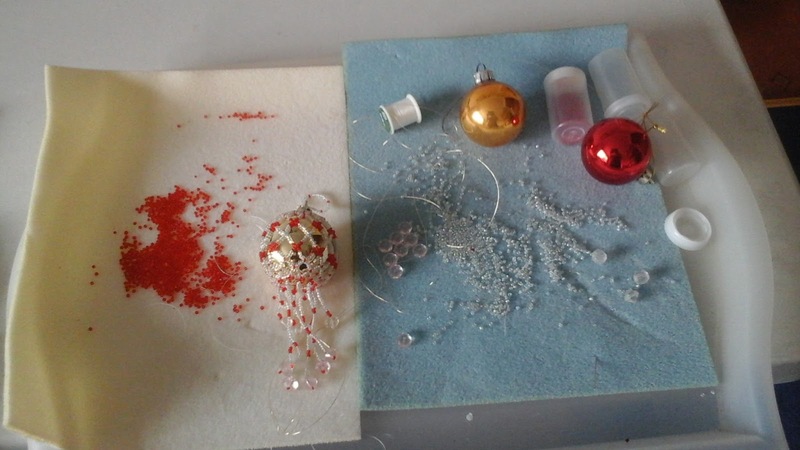 I started with all good intentions, back in January, with these baubles for my brothers and sister. 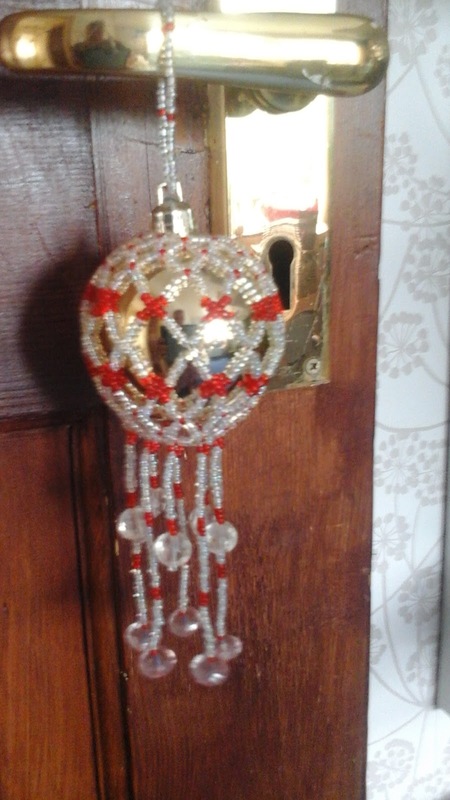 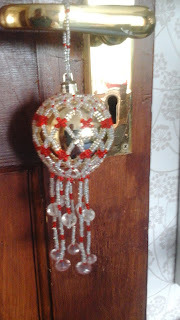 The decorations had hung on Mum & Dad's tree, and I thought making bead covers would turn them into cute keepsakes. 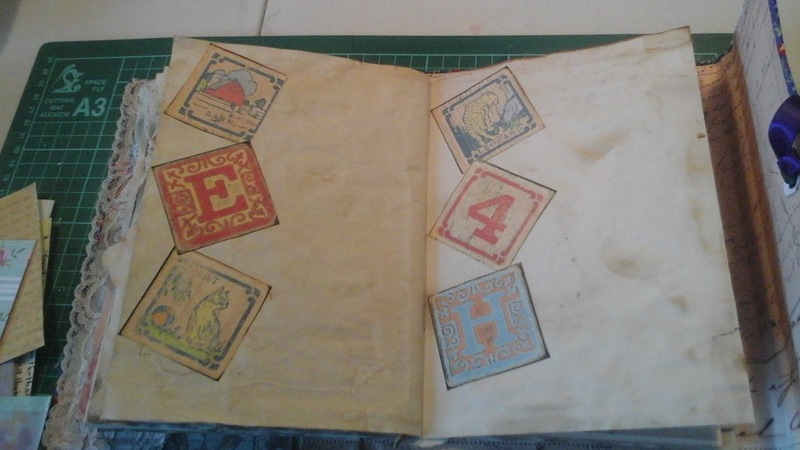 Once I got the hang of them, they were easy and fun to do. 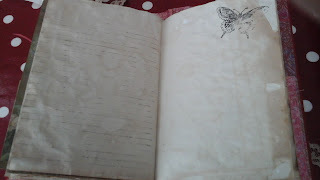 However, in true flutterby style, the attention then wandered, and during the summer, I attended a workshop run by Debra, aka Miss Clementine. 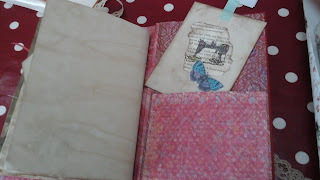 I'd fallen in love with the fabric pictures on her stall at the NEC a year back, so couldn't wait to have a go. 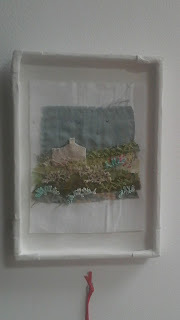 I love this one; it's hanging in our sitting room, and I hope to make more as gifts, later. 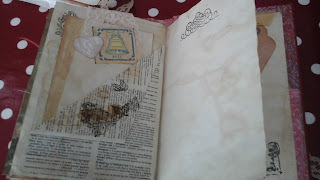 In Autumn, I discovered junk journaling, and it was love at first sight. I set to work on a journal for a friend's special birthday, and learned lots of new techniques. 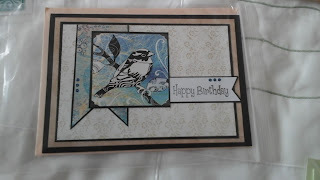 I've always loved card making and other paper crafts, so was able to use lots of rubbish kit I've hoarded collected over the years. This one has a soft cover, using fabric left over from a baby's dress (she's now 37 lol!) 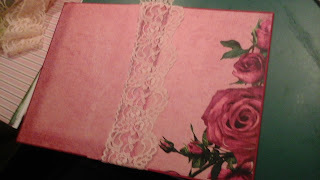 and lace. 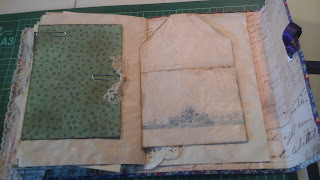 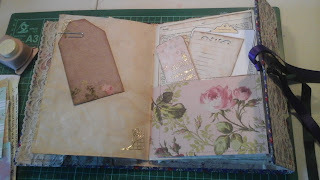 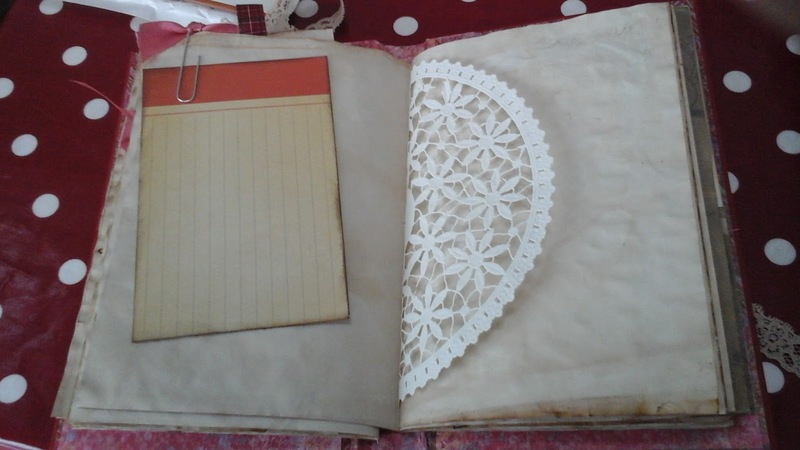 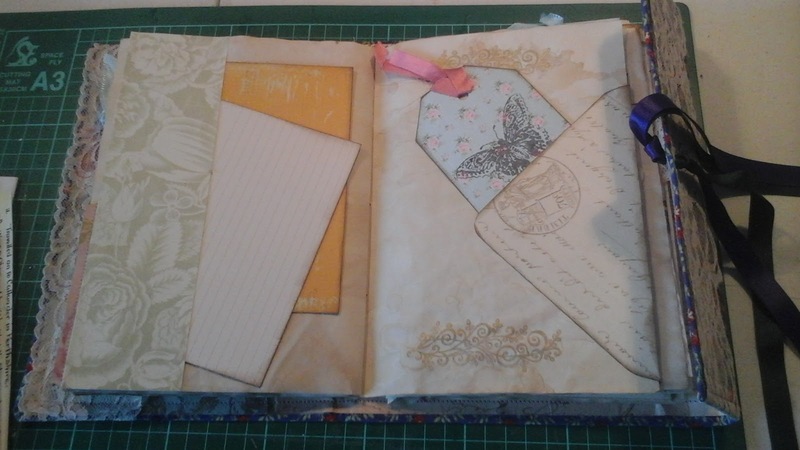 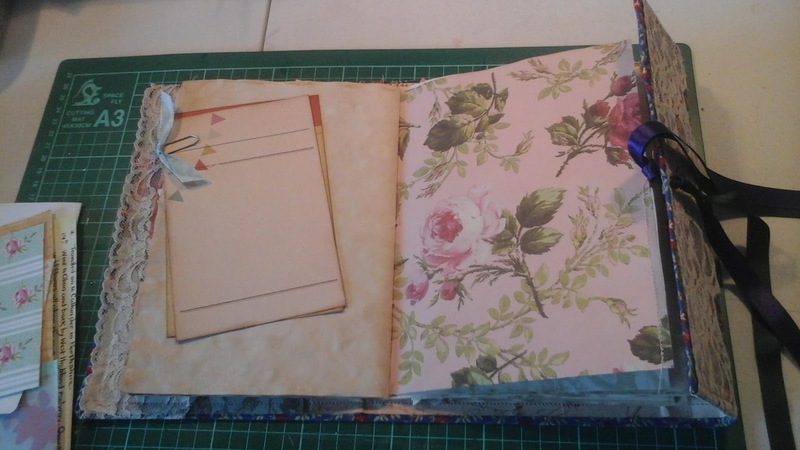 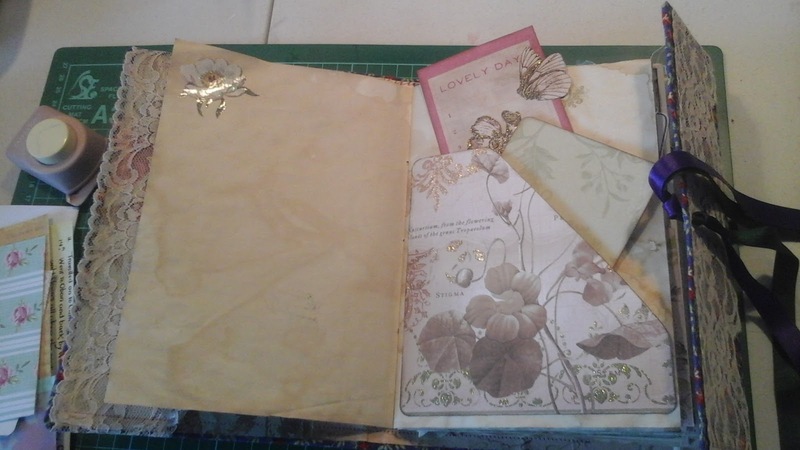 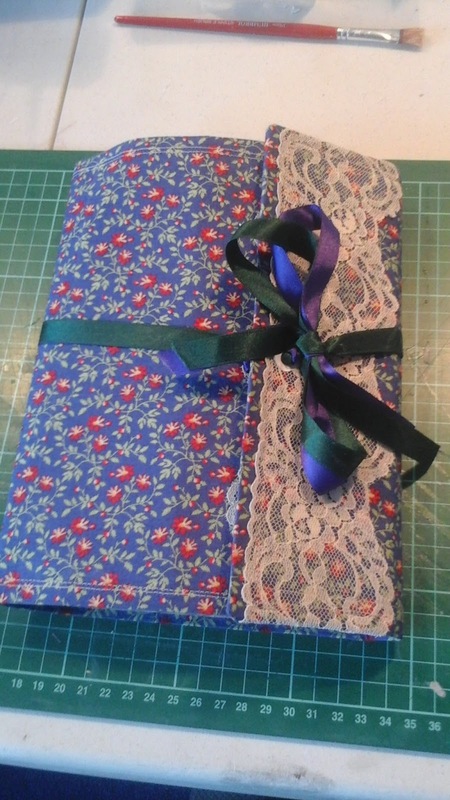 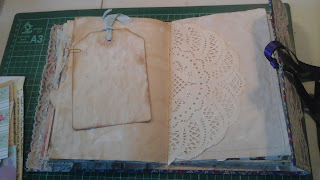 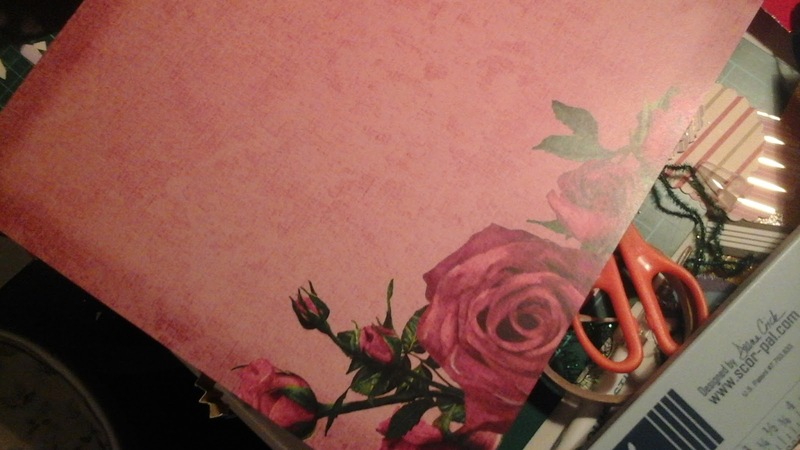 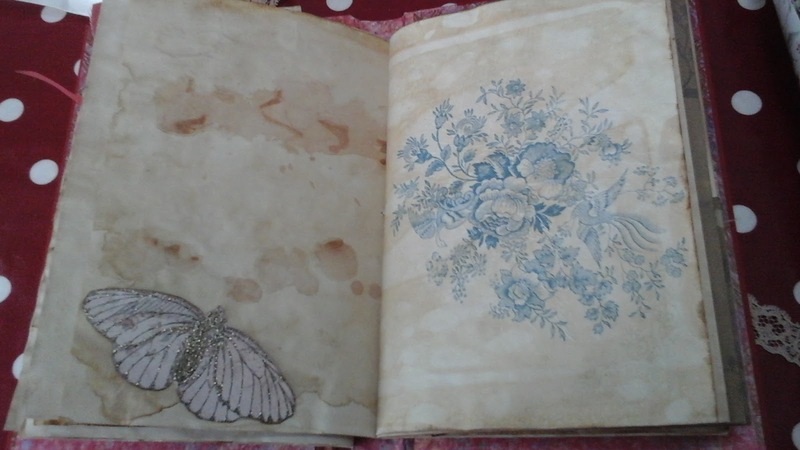 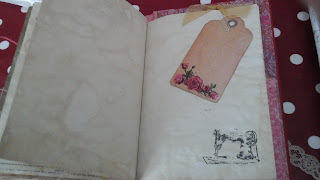 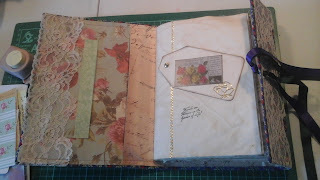 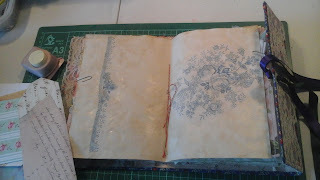 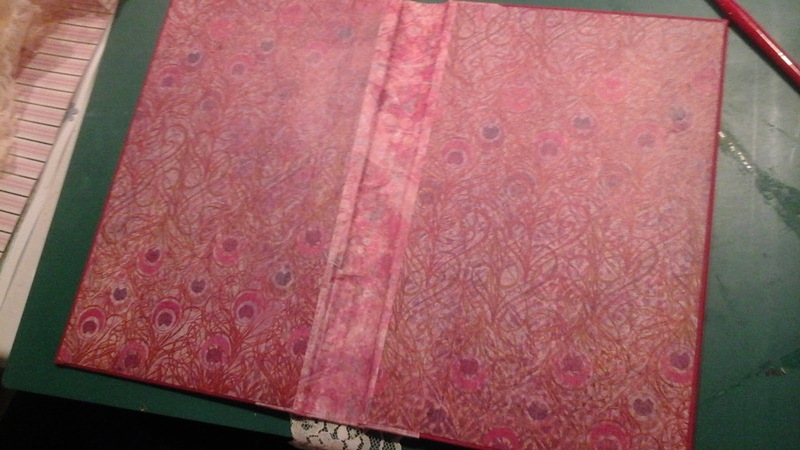 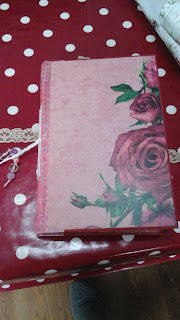 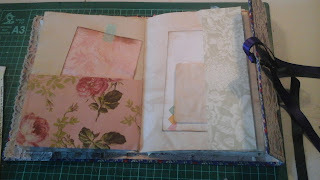 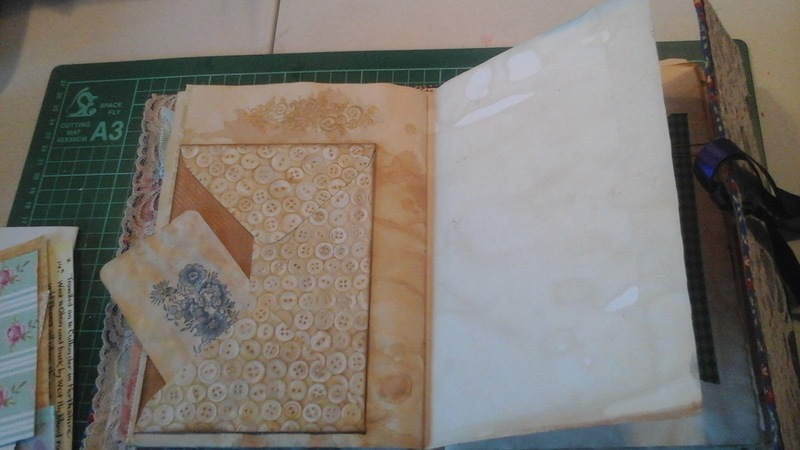 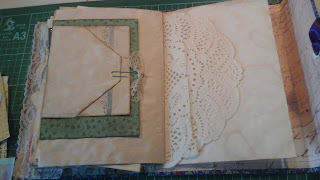 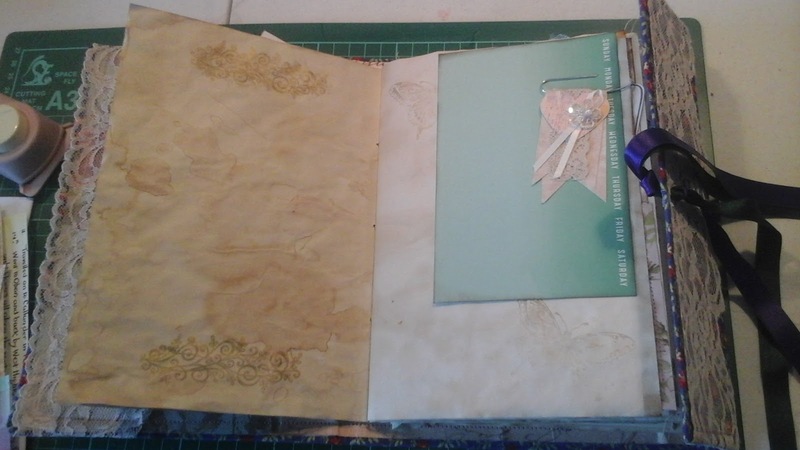 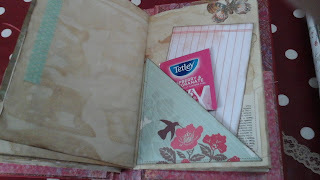 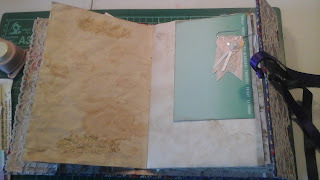 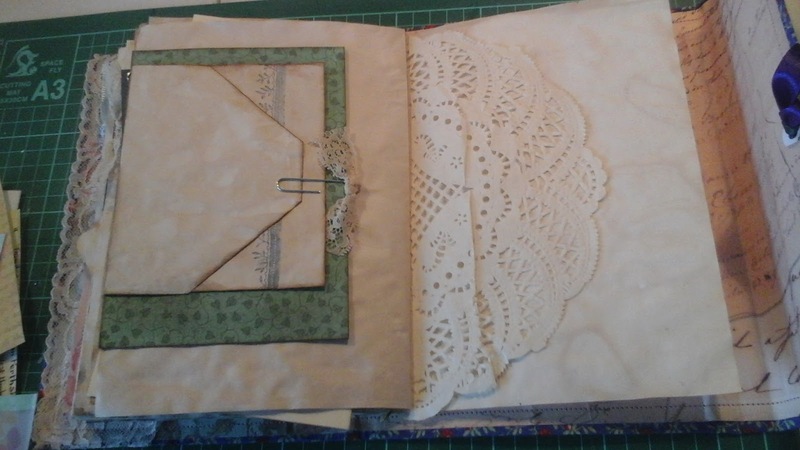 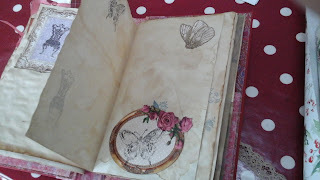 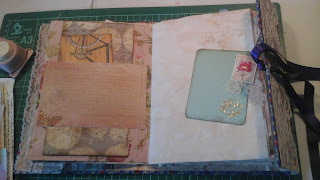 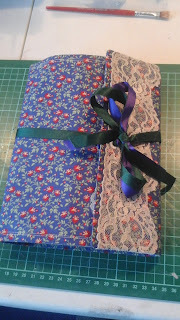 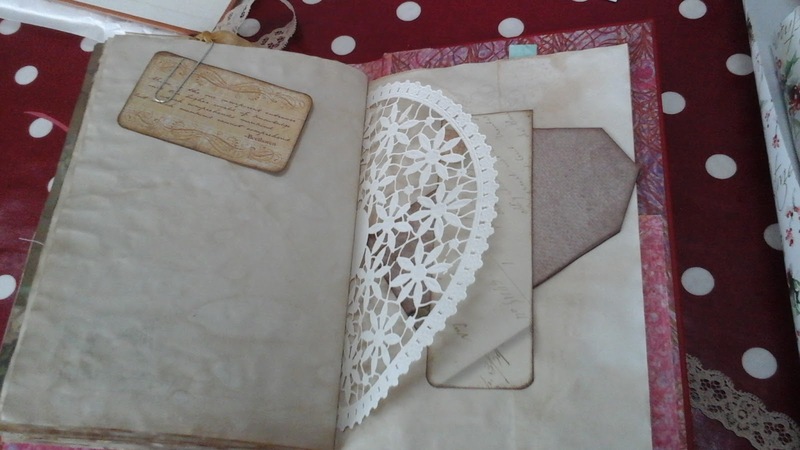 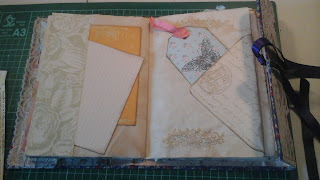 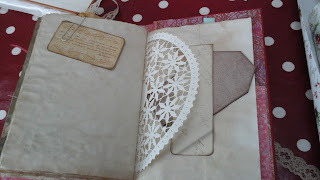 I covered inside the front and back covers with paper from my stash, and adding a lace tuck spot in the front, with a couple of journaling cards to write on and a ribbon tie. 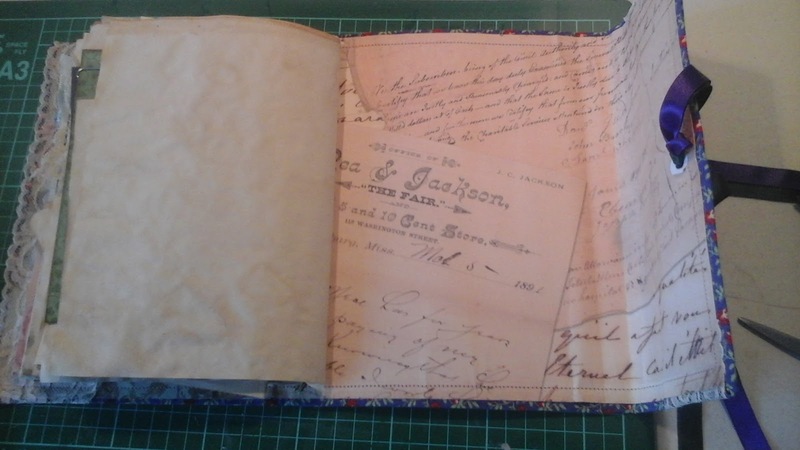 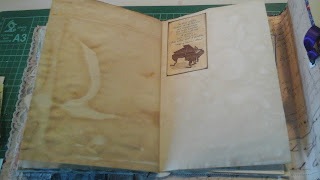 In order to get a vintage look, I coffee-dyed the papers for the inside, and made one large signature, which was sewn in with pamphlet stitch. 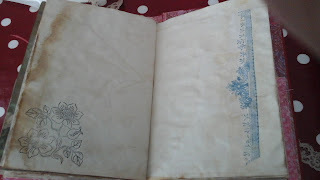 It was all a steep learning curve, and I've made changes in books since this one. 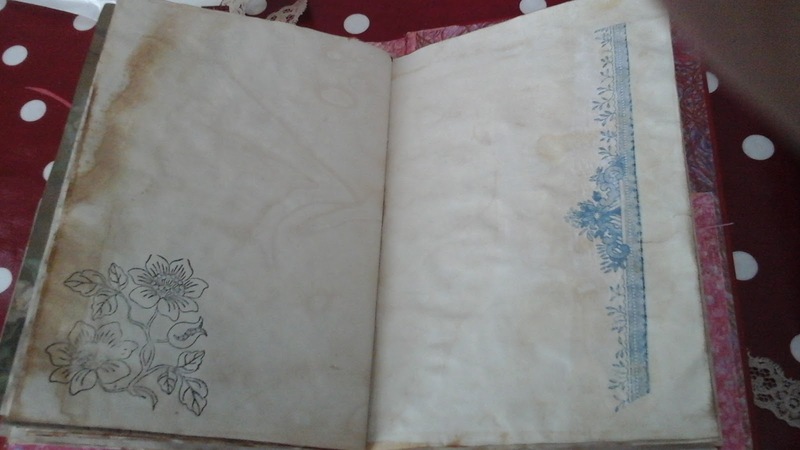 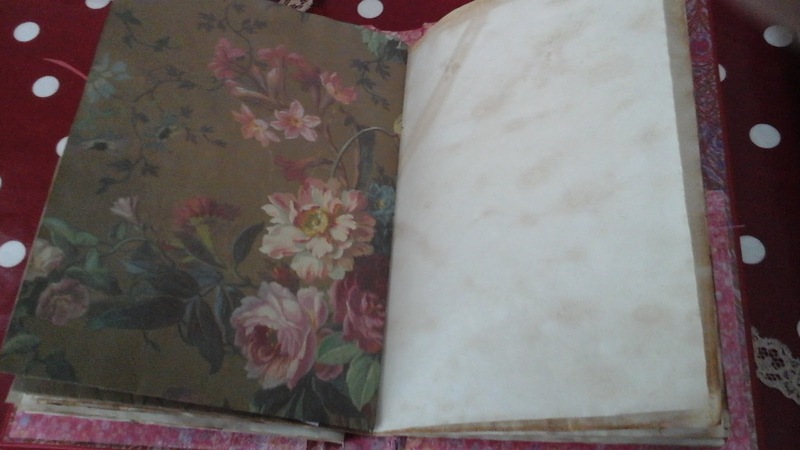 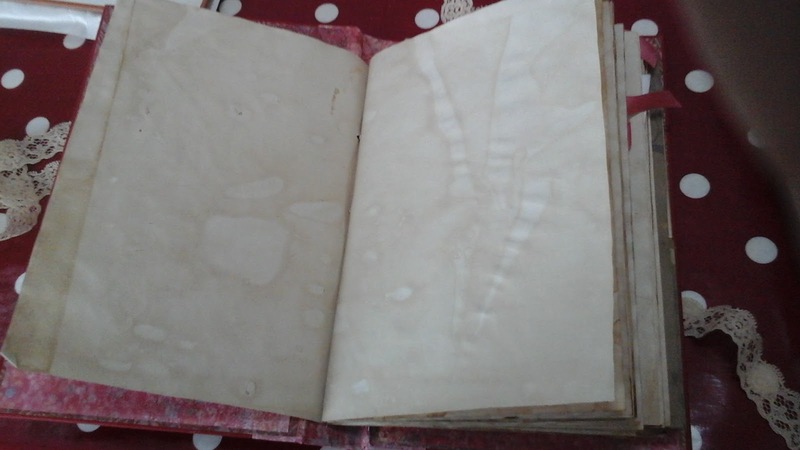 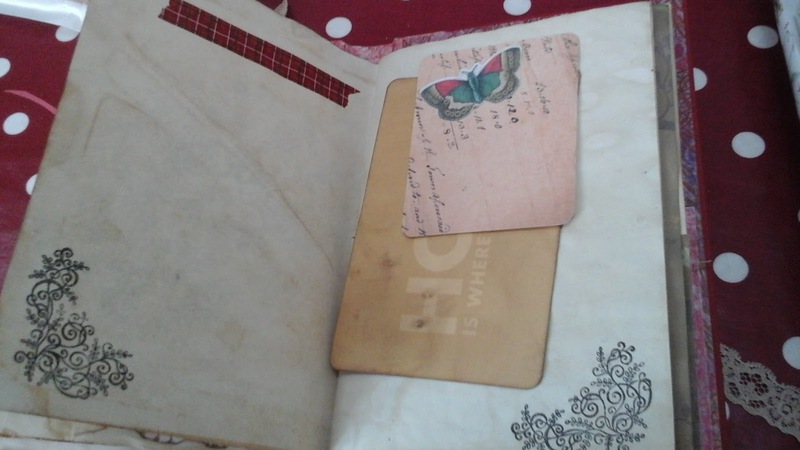 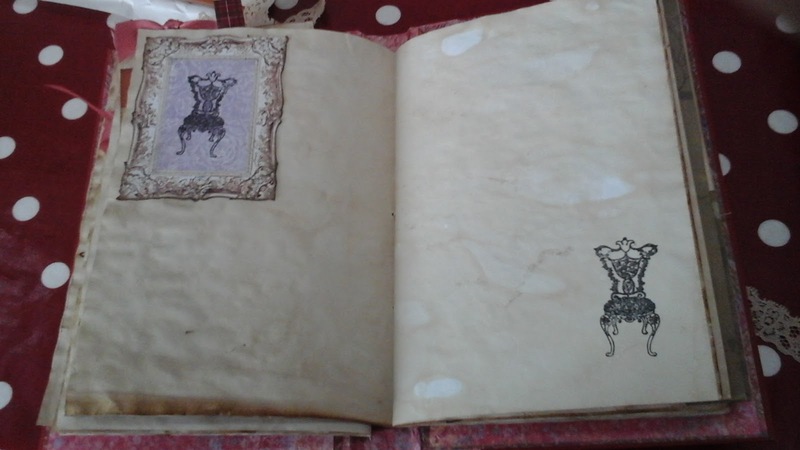 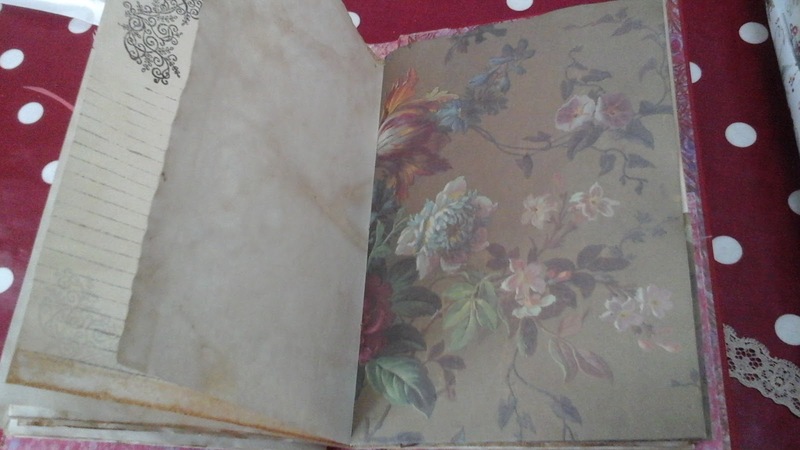 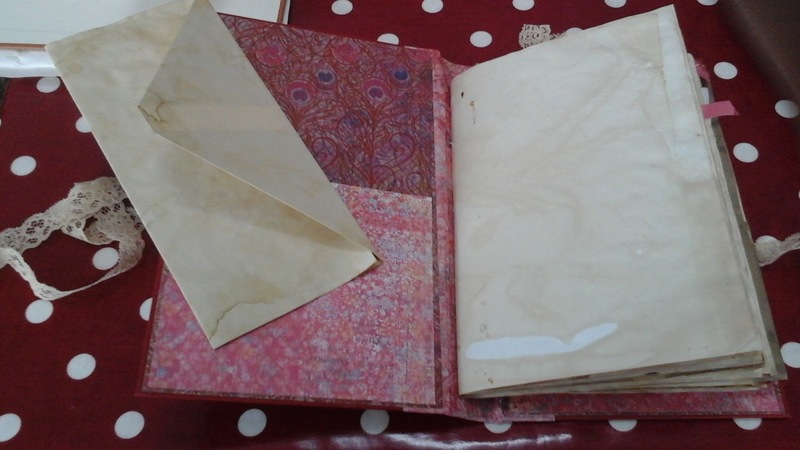 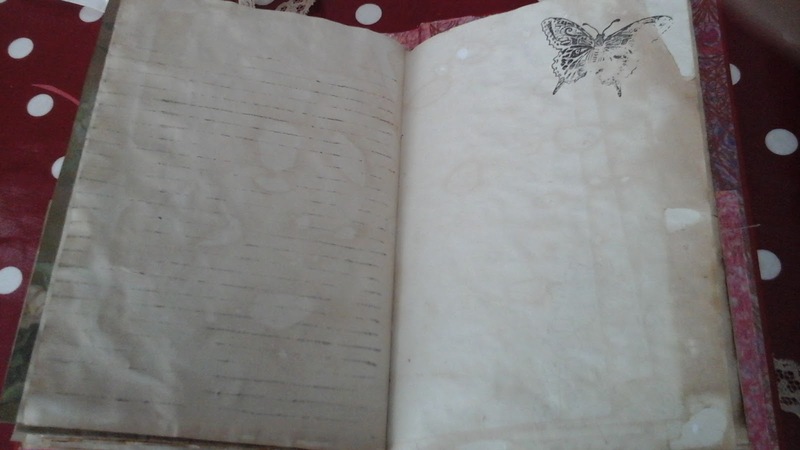 There were blank pages to write on, with pockets and tuck spots and hidey holes for notes or squirreling things away. 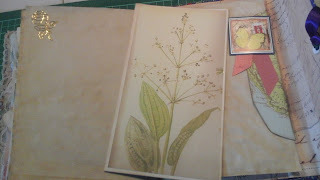 and pretty vintage-looking papers from my stash. 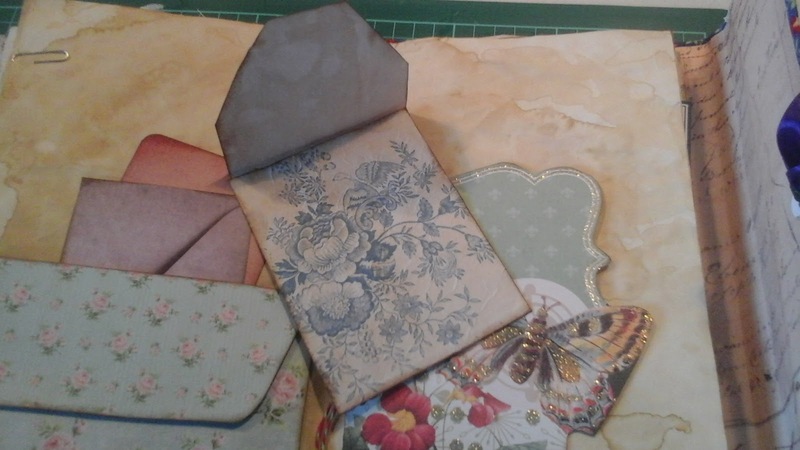 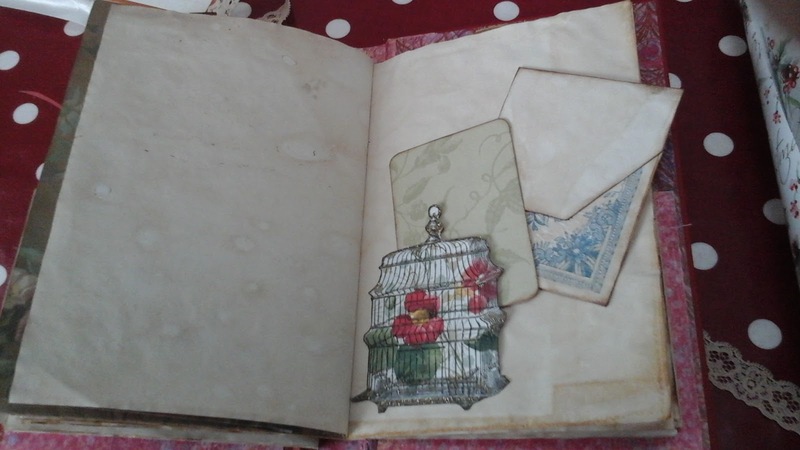 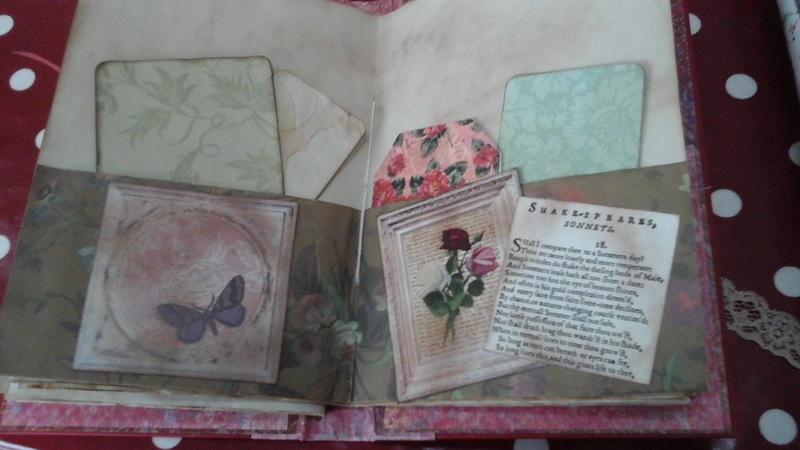 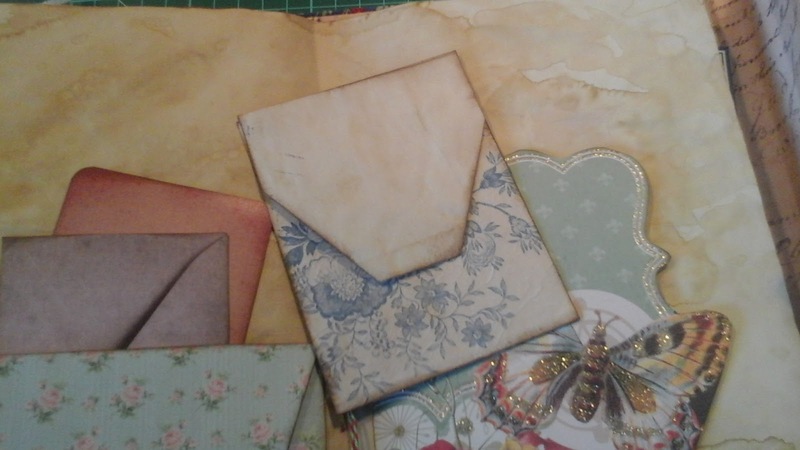 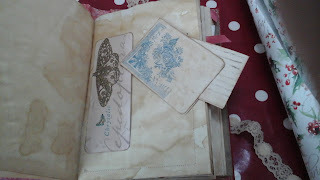 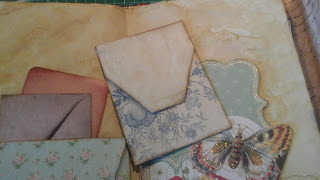 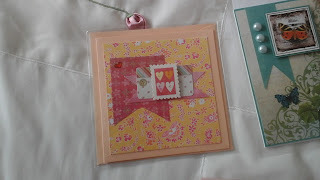 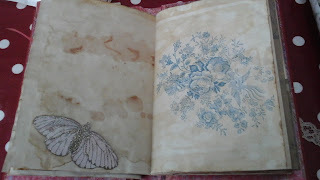 and hand made envelopes with more napkin decoupage (I love this effect). and I added larger journaling cards, too. 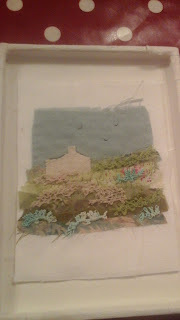 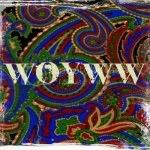 I really enjoyed this project in particular, and couldn't wait to try some more ... but having bored you enough, it will have to wait for the next instalment. 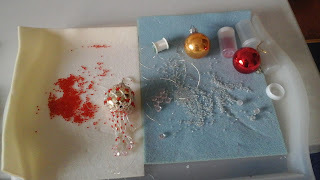 I hope you've all been enjoying a lovely Christmas break. 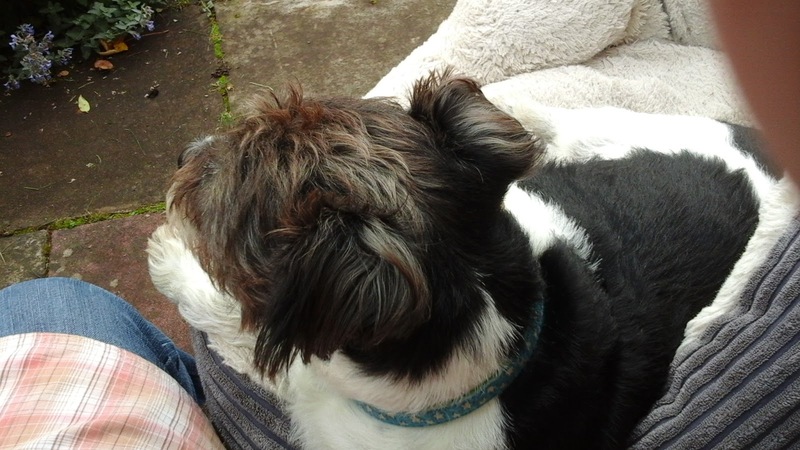 Mornings like today are very precious at weekends, this time of the year - a quiet Sunday when Basil and I could sit and enjoy the warm sunshine, listening to the breeze and little birds, with a coffee (me) and watching for squirrel intruders (him). 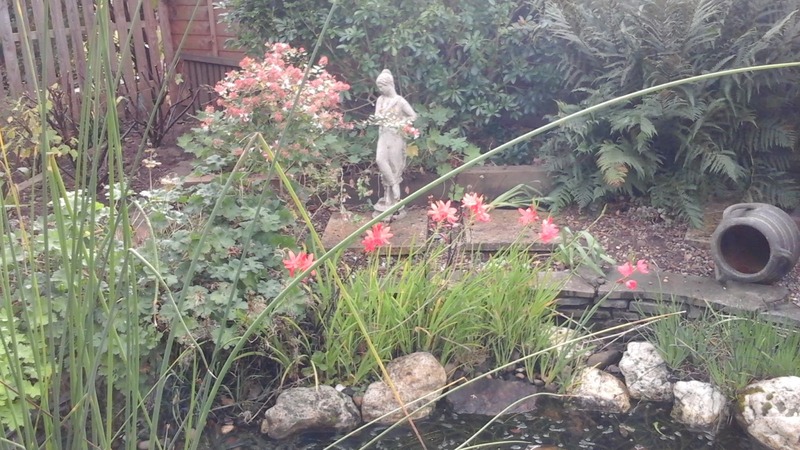 The garden's settling down for the winter, but there's still quite a bit of colour tucked away. 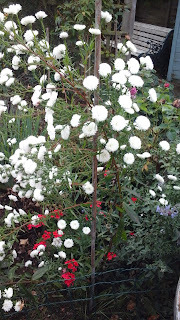 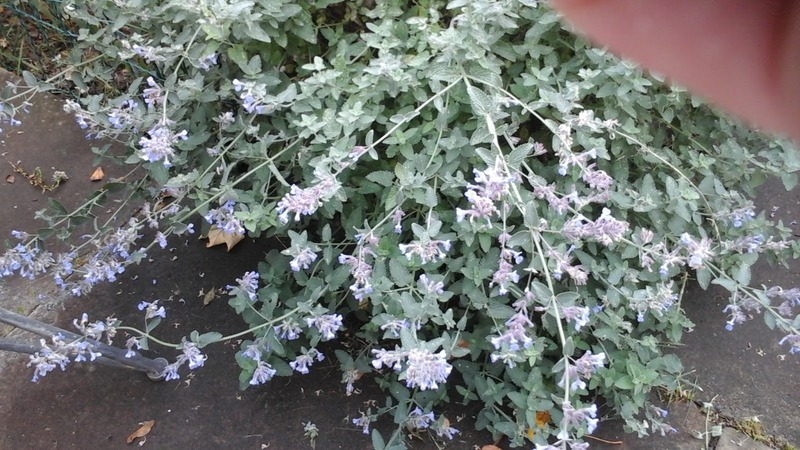 I'm so glad I didn't dig this out as a weed earlier in the year - the bright white brings a lovely sparkle, flowering its socks off, while the faithful catmint is still producing food to nourish the bees. 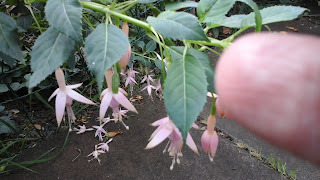 A demure fuschia is still producing blossom and a rose I was given in memory of Mum still has a couple of blooms. 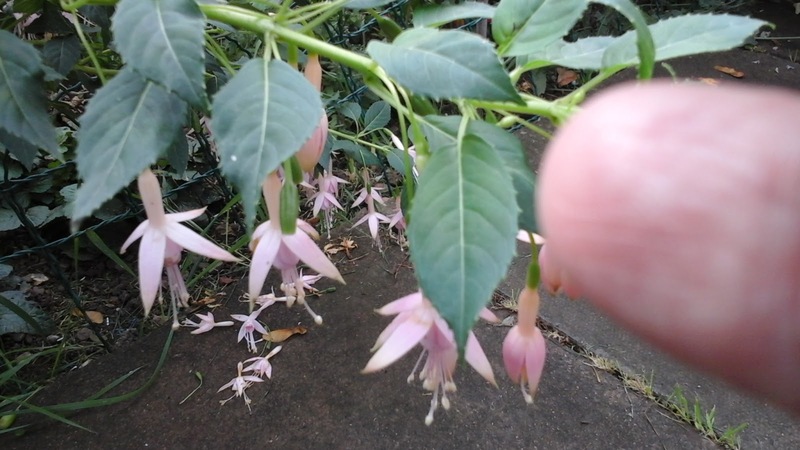 Haha - excuse my thumb! 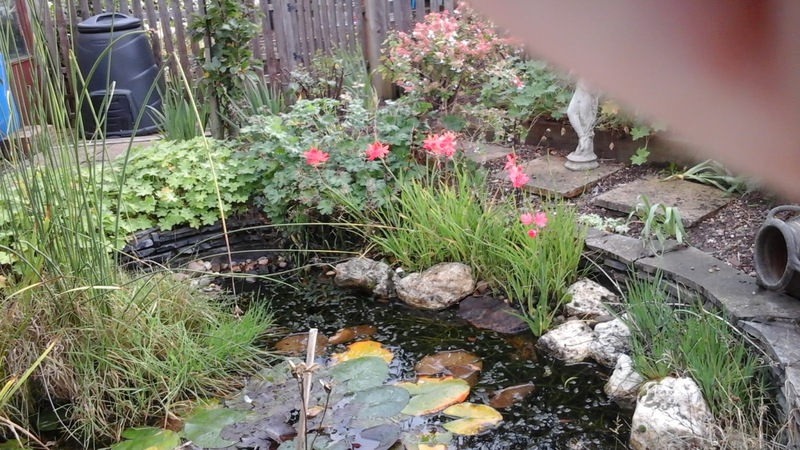 After five years, the pond is looking really established now, with all the shrubs bulking up nicely. 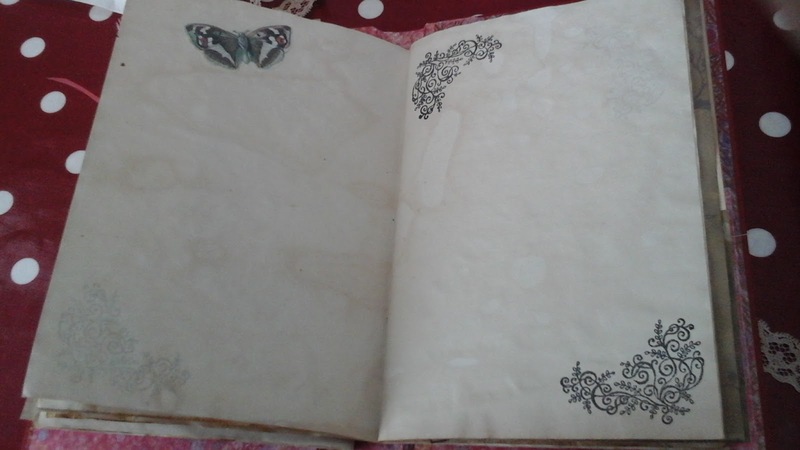 The addition of frogs has been a godsend. 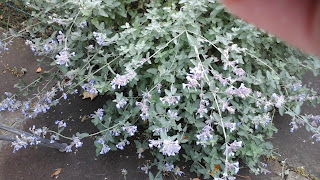 Although they're rarely to be seen, we haven't had any slugs or snails this year, and previously we've been overrun with them. Again - sorry for the rogue finger - the sun was so bright, I didn't notice it. 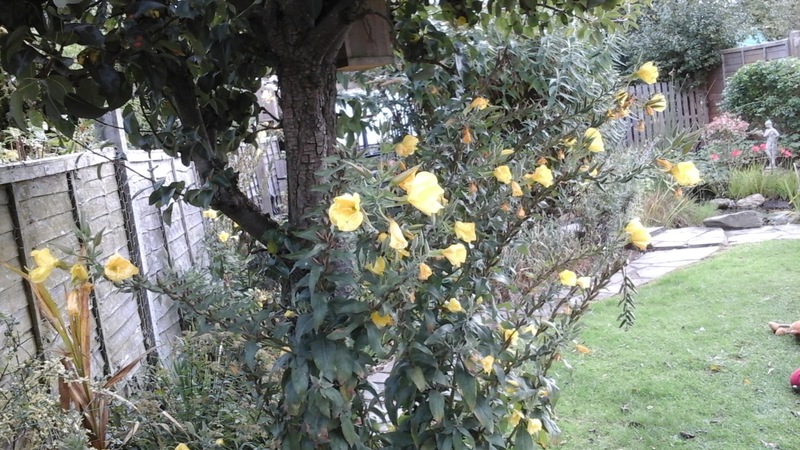 The last of the colour comes courtesy of the lemony evening primrose, round the pear tree. 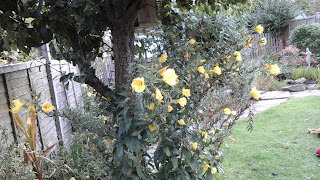 I don't know how they first arrived, but happily seed themselves freely. 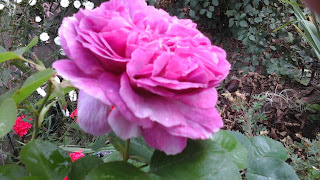 The little primulas (courtesy of Lidl a couple of years ago) certainly earn their keep, too, popping up all over the beds, and still busy flowering. 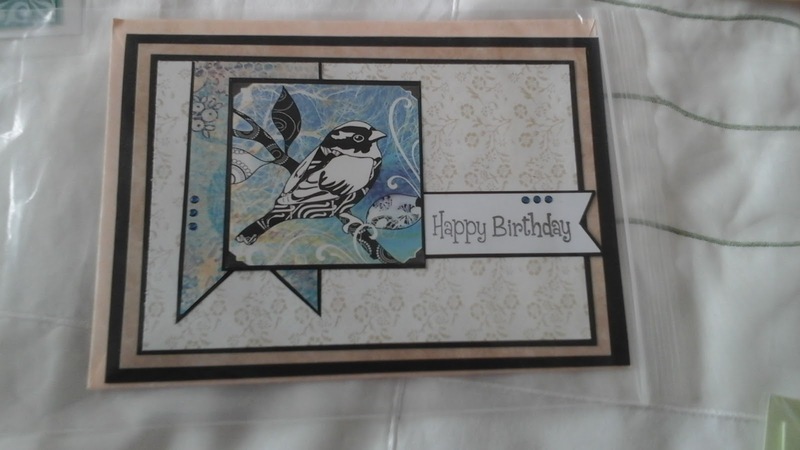 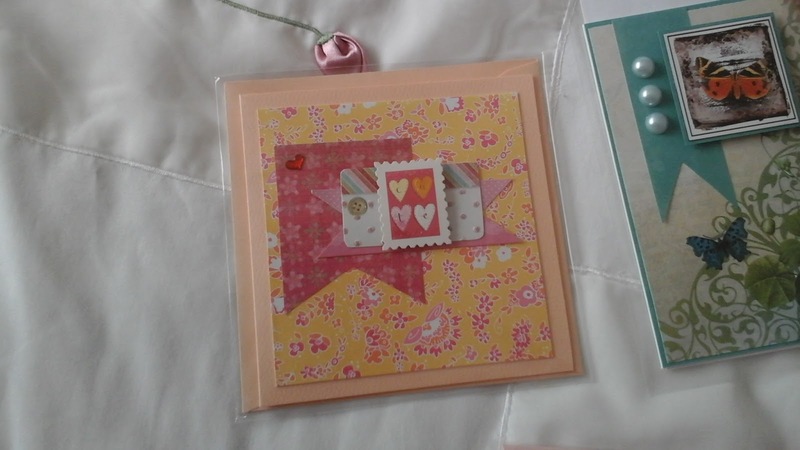 Indoors, I've been using up old/donated stash on cards to sell for charity. It's slow and laborious, trying to match in-matched stuff, but good fun. 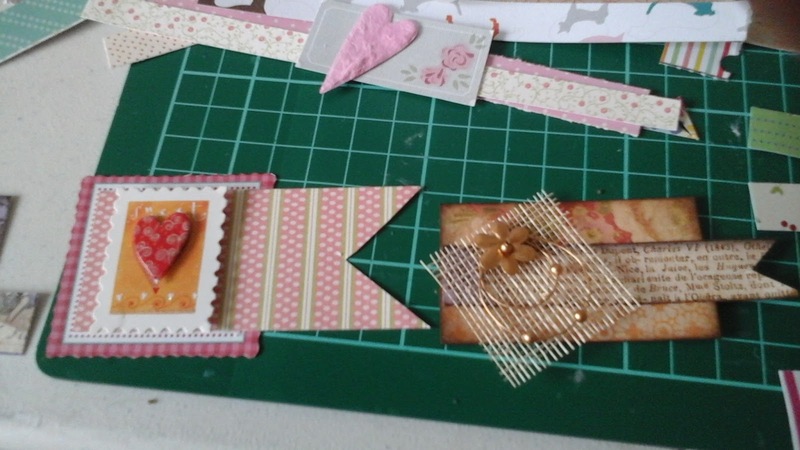 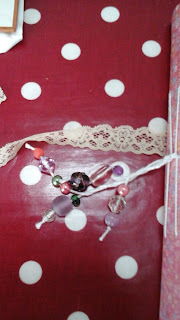 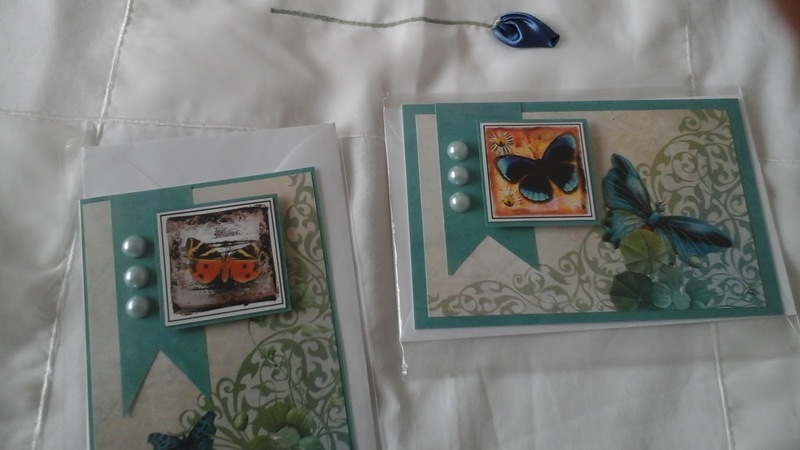 I've been making embellishments and clusters to add to cards later - this actually does save time and head-scratching, when you have the pieces already to hand.